Ephoron leukon is a very prolific white mayfly hatch that can come off in such numbers that it appears like a white snow blizzard of mayflies. Ephoron leukon and Ephoron album are commonly found across the country on many streams and rivers and is often referred too as the White Mayfly hatch. In August, some Wisconsin rivers and streams will explode at dark with white mayflies dancing across the water. It's an amazing sight to behold! Ephoron leukon is a burrowing nymph and lives in the sand and silt bottom areas of the stream bed. They begin hatching in August at dusk and continue into the twilight hours. The nymphs seem to quickly rise to the surface to emerge as a dun and fly off. Then the male duns quickly molt into spinners (2 tails) and come back over the water to mate with the female mayflies carrying their yellow egg sacks (females don't molt). Ephoron leukon adult mayflies are positively phototactic, meaning they are highly attracted to light. Holding a flashlight near the stream after dark should bring a swarm of white mayfly adults to the light source. Unlike other mayfly species, Ephoron leukon emerges, mates, lays their eggs on the water and dies all in the same night. 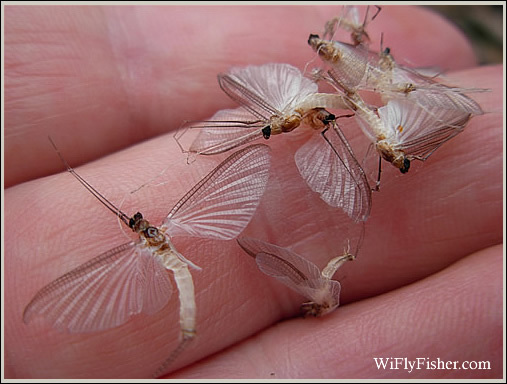 Each night brings a new batch of white mayflies hatching. 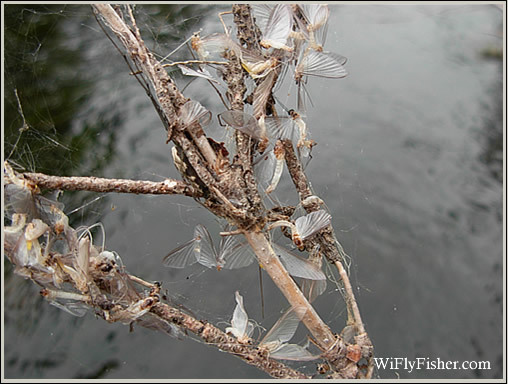 Shortly after mating in mid-air the surface of the stream is blanketed with hundreds of spent-winged, white body mayflies. All you see on the surface are the small little rings left by trout quietly sipping in the dying spinners in the moonlight. 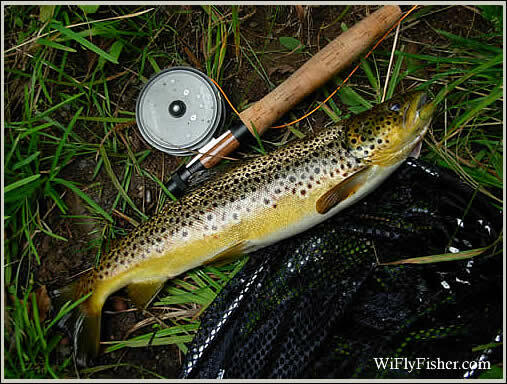 The hatch lasts for 2-3 weeks and gives fly fishermen a great opportunity to hit this hatch right. 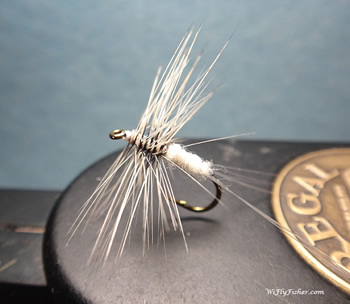 Although you may try nymph patterns, emergers, duns and spinner patterns seem to work the best. Be sure to have a good flash light to switch flies in the twilight hours. The fly should be tied sparse. Ephoron spinners are very delicate and their wings are almost invisible when they are laying spent on the water. Always wondered what these were. Not a big fly fisher, but I would wear a rain jacket to fish downstream of the Alexander Dam on the WI river when these were hatching. Usually right before school started again in the fall. Fishing was insane at the beginning of the hatch, but would soon taper off as everything had its belly full. This page does a great job helping explain to me the Ephoron luekon hatch. Thank you! Thanks for the help. Love to see your favorite pattern too. I was unaware the female did not molt. I live near the Susquehanna River in York, PA. Starting around the 3rd week in July millions and millions of Luekon start to emerge at late dusk. There are just so many millions I have to but up my top shirt button and wear a head net. My vest gets literall covered with molting males. If I watch I can see than start to shake and wiggle and literally change from dun to spinner in front of my eyes. They change so quickly that almost all fly off with the dun case still attached to their posteriors. We can catch a couple dozen smallmouth in a night along with channel catfish.